Each day, your local government is hard at work making Ferndale an even greater place to live, work and play. Here is a little introduction to some of the people who work for you, the people of Ferndale. Riley Sweeney prepares materials for the city website, social media, is our public information officer, handles the City’s insurance, interacts with our community groups and runs the City’s Parks and Recreational activities. If you have a question about something going on in Ferndale, he is a great place to start. You can reach him at (360) 685-2353 or via email by clicking here. Chief Turner oversees our Ferndale Police Department, which includes two lieutenants, three sergeants, three detectives, eleven officers and four support staff. His team works around the clock to ensure that our community is safe and stronger together. 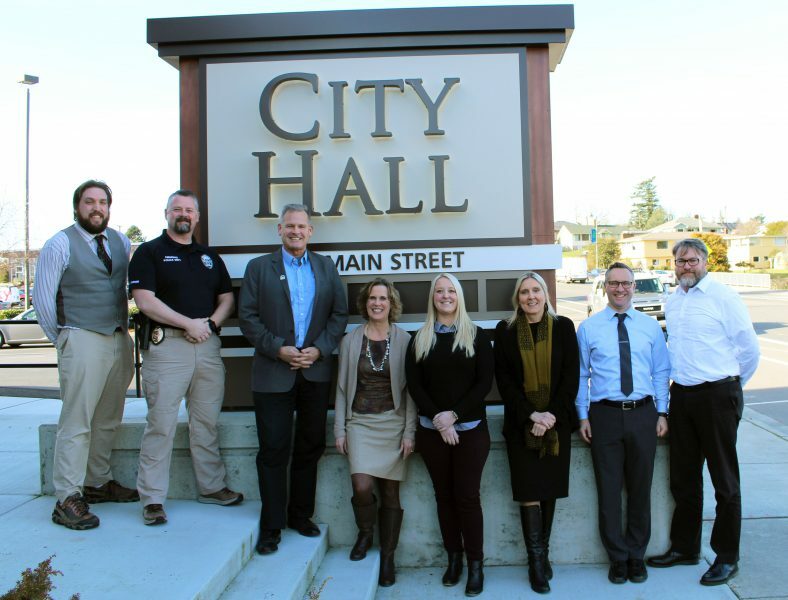 Elected in 2015, Mayor Jon Mutchler provides general supervision over the administrative affairs of the City; including the responsibility for the appointment and removal of personnel; and the execution of the laws and policies as adopted by the City Council. You can reach him at (360) 685-2350 or via email by clicking here. Susan Duncan oversees compilation and distribution of twice-monthly Council agendas and packets, and is also responsible for maintaining City records as the official records depository and archivist for Ferndale. She handles public records requests and serves as the Human Resources department for the City. Haylie Miller oversees the community development department which is responsible for working with community members, elected officials, project applicants, and others to establish a collective vision for the community. This includes setting and updating land use regulation, building codes, permit requirements and our comprehensive plan. Sirke Salminen is tasked with the development of the City’s Annual Report and Budget. With the help of her finance team, she also manages the annual audit and investments, provides monthly and annual revenue and expenditure reporting in relationship to the annual budget, and prepares water and sewer utility billings. Jori Burnett is responsible for the day-to-day operations of the City and provides oversight on all the department heads. He sets long-term goals for the staff and facilitates the general improvement of the city. Kevin Renz oversees the Public Works department which plans, constructs, operates, and maintains City water, sewer, storm, transportation systems and other facilities and buildings for the City.